Although the NSS Evo3 series was released is already two years old, these units are still available, and still some of the best from Simrad. In this post, we’re going to cover the NSS7 Evo3 part number 000-13233-001. It’s a Simrad fish finder and chartplotter that offers an impressive array of sonar and navigation features. However, it does not include a transducer. The Simrad NSS7 Evo3 has integrated dual-channel CHIRP sonar and StructureScan HD which includes DownScan, SideScan and ForwardScan. The unit also supports StructureScan 3D imaging, but in order to use this sonar technology, you will need the StructureScan 3D external sonar module and the 3D transducer. As we’ve mentioned above, the unit does not include a transducer but is compatible with various transducer from Lowrance and Airmar. Most anglers recommend the Lowrance TotalScan transducer for this unit as it is the most versatile and doesn’t require an external sonar module. This transducer can operate at 83/200 kHz for the 2D CHIRP sonar, offering the possibility to use High-Band CHIRP and Mid-Band CHIRP, and at 455/800 kHz for StructureScan, offering the possibility to use DownScan and SideScan. The Lowrance standard HDI Skimmer can also be used with this unit, as well as the Airmar TM260, the Airmar P66, the ForwardScan transducer, and many more. 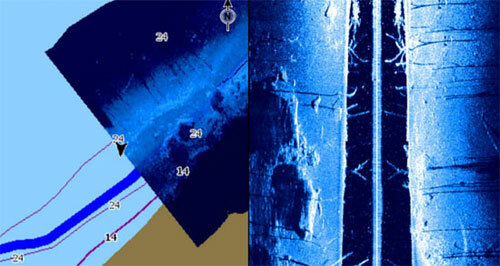 In terms of external sonar modules, the unit is compatible with the SonarHub, BSM-3, and BSM-2. These offer greater depth scanning possibilities (up to 10,000 ft – 3,000m), and if paired with a 50/200 kHz transducer, this Simrad fish finder system is ideal of off-shore, deep water fishing. 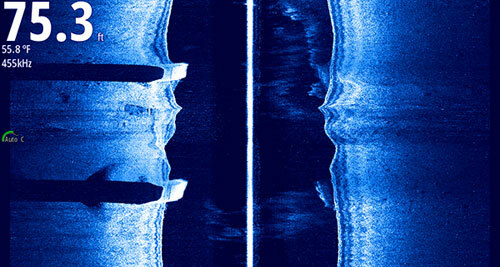 The Simrad NSS7 Evo3 offers the full range of standard sonar features. To begin with, it has Fish ID, A-Scope, Split-Zoom, Bottom Lock, Sonar Recording and Sonar History Rewind, and if paired with a transducer that integrates a temperature sensor, it can show the water temperature as well. The DownScan Overlay feature is also included. This feature allows you to blend the DownScan sonar with the 2D CHIRP sonar, in order to benefit from a different view of the underwater environment. When activated, this feature allows the Echosounder menu to expand including basic DownScan options. 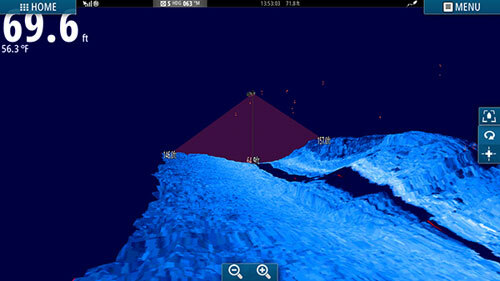 The Simrad NSS7 Evo3 unit is equipped with a 34-channel, 10 Hz internal GPS. This means it can provide position updates 10 times per second showing the movement of the boat icon on the map in real-time, without jumping from a point to another. It offers enhancements via WASS, MSAS, EGNOS, and GLONASS. A GPS speed feature is also available. The unit can save up to 6,000 waypoints in its memory, offering a decent palette of icons to make them more suggestive. It also has route creation and track plotting functions. It can save up to 500 routes with up to 100 waypoints per route, and up to 50 tracks with up to 12,000 track points for each track. Of course, each track can be converted into a route, you can add waypoints to it and re-trace it anytime you want. As the title suggests, this Simrad NSS7 Evo3 is equipped with the U.S. Insight charts. These charts offer advanced detail for over 8,000 US lakes and rivers, with detailed contour lines, relief shading, shoreline details and depth soundings to 1,000′. However, the unit is compatible with Navionics Gold, Navionics Platinum+, C-MAP Max N, and C-MAP MAX N+ charts. The StructureMap feature is available with this unit. If you have a SideScan transducer, you have the possibility to overlay the SideScan imaging on the map for a better awareness of the underwater environment in relation to various points of interest on the map. You can also upload your StructureMap created maps on the Insight Genesis base, or download already created maps from there, using the internal wireless connection, if a Wi-Fi hotspot is available. The TripIntel™ feature is also available. TripIntel lets you store and recall information on your trips. Therefore, you can make better decisions for your next trips. For example, based on the recorded information, you can plan a better average vessel speed for your desired arrival, you can plan your fuel consumption, benefit from tide information and tide graphs, and more. Finally, the unit supports AIS and Radar modules. It’s compatible with Broadband Radar, Halo Pulse Compression Radar, HD Pulse Radar, and AIS units such as the NAIS400. First of all, the NSS7 Evo3 features a 7″ diagonal, color TFT display, with adjustable, white LED backlight. It offers superior brightness and angle visibility (80° top/bottom, 80° left/right). It has a greater pixel resolution than the older NSS7 Evo2, being 1024 x 600 (more pixels, sharper imaging). It is also IPX6 and IPX7 waterproof, which essentially means that it can withstand incidental water exposure with no problem. The unit has a user-friendly interface, with a keypad assisted touchscreen display. In other words, it responds to touch commands as a tablet but also has a turn-knob and several buttons for most commands on the right side. The internal operating system is highly intuitive and easy to use. It gives you the possibility to personalize the home page of your unit with the most used applications, and view/use up to four applications per page. The unit is highly networkable. It supports NMEA 0183, NMEA 2000 (1 x NMEA 2000 Micro-C port, 1 LEN), and Ethernet (1 x 5 pin yellow connector). It also has built-in Wi-Fi and Bluetooth. The internal Wi-Fi module allows you to connect your unit to various hotspots for data download or upload, or benefit from smartphone monitoring or tablet control. The Bluetooth feature allows your unit to communicate with a SonicHub 2 module, in order to control various audio devices. A dual microSD card reader is also integrated into the unit. This gives you the possibility to use a microSD with charts, and another microSD for data backup or other purposes, without the need to swap cards. Finally, the unit includes a standard bracket mount but the option of a flush mount is also available. A unit cover is also included. Surface mounting kit not included. The Simrad NSS7 Evo3 Insight is a versatile multifunction display offering a wide array of sonar and navigation possibilities. 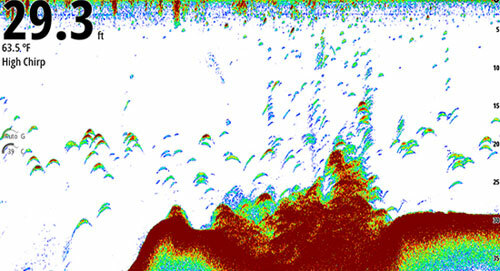 It has built-in 2D CHIRP sonar, SideScan, DownScan and ForwardScan. It also supports StructureScan 3D. It is equipped with a 10 Hz internal GPS and comes with the US Insight charts. It’s also highly networkable and supports many navigation tools such as Radar, AIS, FLIR cameras and more. 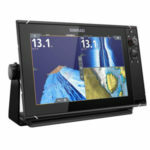 In all, it’s an outstanding fish finder and chartplotter, perfect for a wide range of boats, great to have either if you are navigation off-shore or inland.